Set in Centro, the Navas Hotel is a short walk from the Madrasah of Granada and offers air conditioning, an express check-in and check-out feature and 24 hour room service. The Navas Hotel offers a convenient 24-hour reception as well as a concierge, family/oversized rooms and babysitting / child services. A Wi-Fi connection is accessible throughout the hotel, ensuring you'll have no problems keeping connected during your stay. The hotel also provides an airport shuttle service. All the large and modern rooms at the Navas Hotel include a mini bar, a private bathroom and cable / satellite channels. A seating area, a flat-screen TV and a hair dryer can be found in each room of the hotel. Guests are able to wake up to a gourmet breakfast, which is served on request each morning. The hotel is a 10-minute walk from Granada Cathedral, and a 20-minute drive from Monachil. Shops, restaurants and entertainment are all within an easy stroll of the hotel. 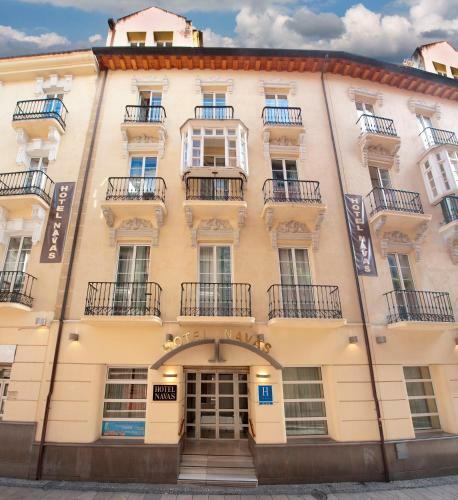 This hotel is 1235 metres from the Alhambra entrance, 399 metres from Plaza Nueva (the absolute centre of Granada), 1676 metres from the train station and 3222 metres from the bus station.